florcita's news: Carolita bag from the "Tierra" line of handbags. Carolita bag from the "Tierra" line of handbags. This wool is fantastically structural. 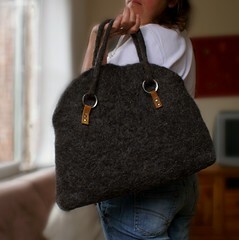 Thick, strong handmade felt in a dark brown shade. I have lined it with cotton just for a finish touch. It has inside a small pocket which coses with a wooden button (also made by me!). The leather straps where hand cut and sewn by me as well. It's big and super handy!